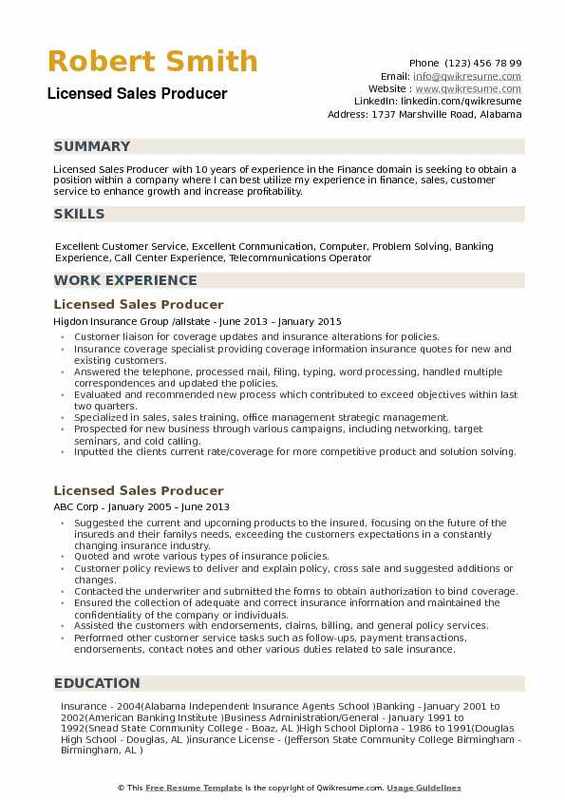 As a Licensed Sales Producer, the professional will provide excellent service by assisting the customers with their insurance service needs. 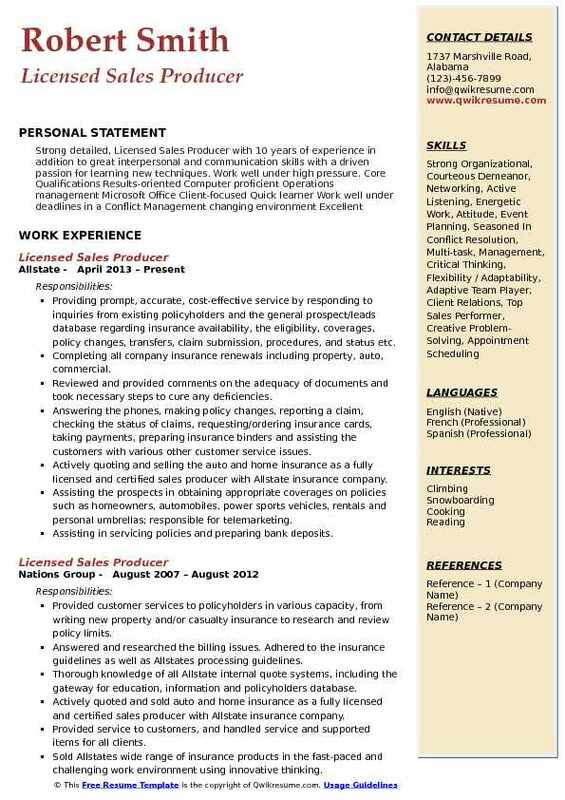 The other duties typically mentioned in the licensed sales producer Resume include – preparing quotes, administering all leads, performing sales calls, developing required sales documents, coordinating with customers and managing policy expiration dates, preparing and updating all sales records, preparing sales campaigns, managing all correspondence and updating policies. 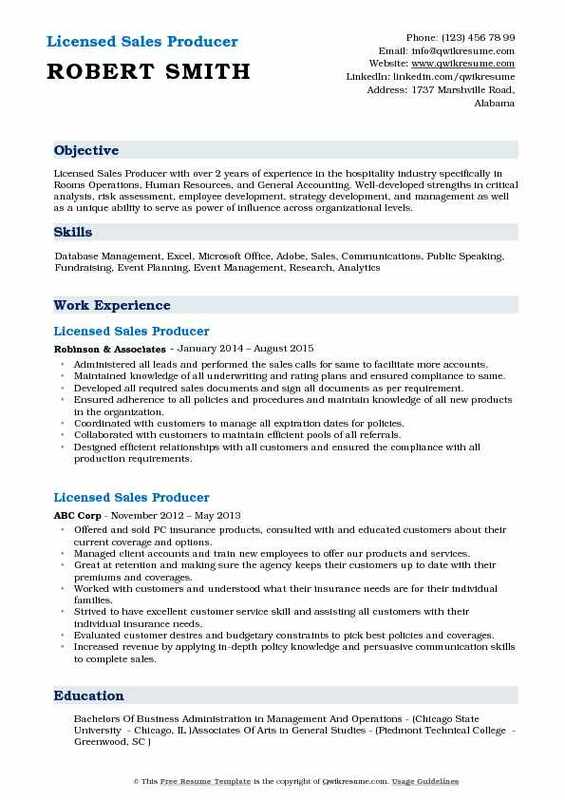 A successful resume for this post should contain qualifications and skills associated with this designation such as – organizational skills, communicational skills, interpersonal and negotiation skills. Additionally, the candidate is also expected to possess good knowledge of property and casualty products and be able to multitask and have customer advocating skills. Educational backgrounds for this position normally mention a college degree in majors such as finance, economics or business. Summary : Outgoing Licensed Sales Producer I with 13 plus years of experience is offering superb customer service proficiency and passion for exceeding sales goals. 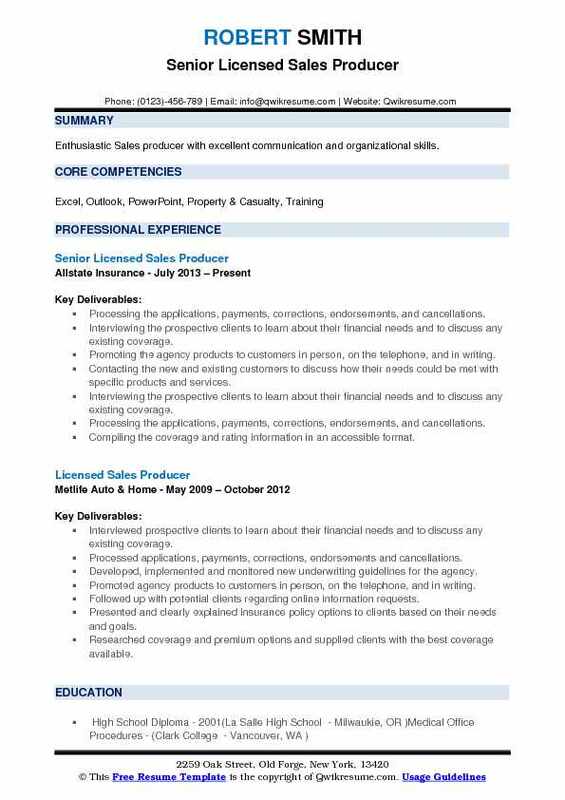 Results-oriented professional, specializing in customer service and sales with unique ability to relate to diverse clients and close high-dollar sales. Highly motivated to create a profitable environment for both my employer and myself. Using the computers for various applications, such as database management or Word. Performing the payroll functions, such as maintaining timekeeping information and processing and submitting payroll. Answering the telephones and give information to callers, take messages, or transfer calls to appropriate individuals. Collecting and depositing the money into accounts, disburse funds from cash accounts to pay bills or invoices, keeping the records of collections and disbursements. Setting up and managing the paper or electronic filing systems, recording information. Updating paperwork, or maintaining documents, such as attendance records. Greeting the visitors or callers and handle their inquiries or direct them to the appropriate. Scheduling and confirming the appointments for clients, customers, or supervisors. 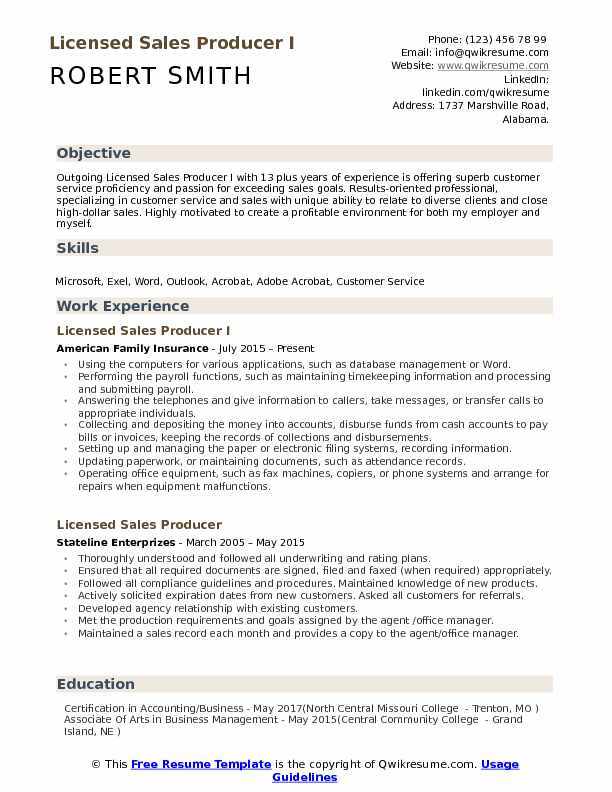 Summary : Enthusiastic Sales producer with excellent communication and organizational skills. Processing the applications, payments, corrections, endorsements, and cancellations. Interviewing the prospective clients to learn about their financial needs and to discuss any existing coverage. Promoting the agency products to customers in person, on the telephone, and in writing. Contacting the new and existing customers to discuss how their needs could be met with specific products and services. Compiling the coverage and rating information in an accessible format. Following up with potential clients regarding online information requests. Presenting and clearly explaining the insurance policy options to clients based on their needs and goals. Researching the coverage and premium options and supplied the clients with the best coverage available. Headline : Sr. 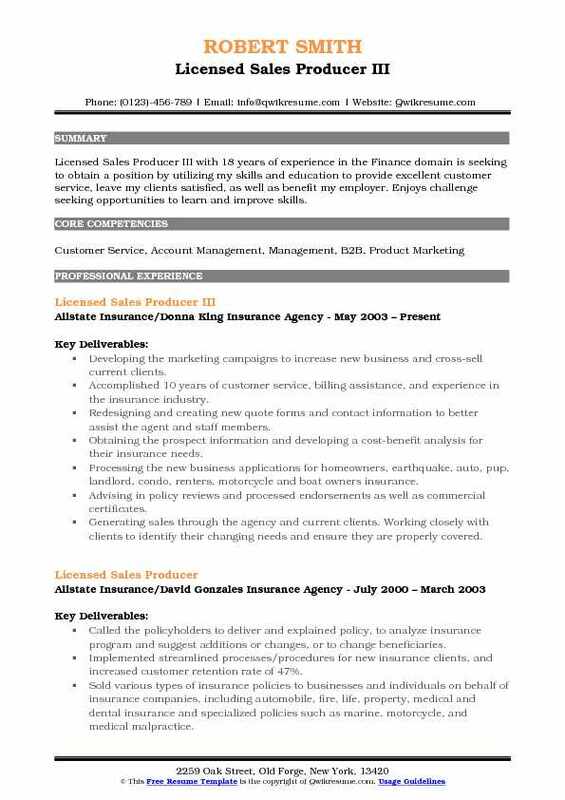 Licensed Sales Producer with 6 years of experience in the Insurance domain, curious in exploring other fields besides insurance (e.g., consulting, marketing, finance, real estate, nonprofit, government, and academia). Produced average monthly premiums of $55,000.00 for personal lines and $35,000.00 for commercial lines. Generated 35% of sales from cold calling and 65% by identifying cross-selling opportunities, referrals, and walk-ins. Consulted business owners on appropriate coverage needs for workers compensation and general liability policies. Submitted new business applications, each with unique underwriting guidelines, for 17+ carriers in Massachusetts. Improved customer retention rates by 85% via call-campaigns concerning cancellation and renewal notices. Handled internal hiring decisions, coached new hires, developed sales incentive programs, and managed marketing. Implemented the accountability system that resulted in greater financial accuracy when tracking the agency's cash flow. Performed administrative tasks (e.g., endorsements, certificates, binders, rmv1s, rmv3s, and bank deposits). Processed 10+ weekly claims and acted as an intermediary between client and carrier to ensure equitable outcomes. Issued 12+ vehicle registrations each week while maintaining 100% compliance with the registry of motor vehicles. Summary : Accomplished customer-centric Licensed Sales Producer with demonstrated success growing market share and accelerating revenue growth. An advantageous blend of creativity and precise execution of solutions that generate award-winning sales results. Motivated team player with proven expertise in sales generation, strategic planning, general management and team development. Detail-oriented and well-organized with the ability to maximize results. 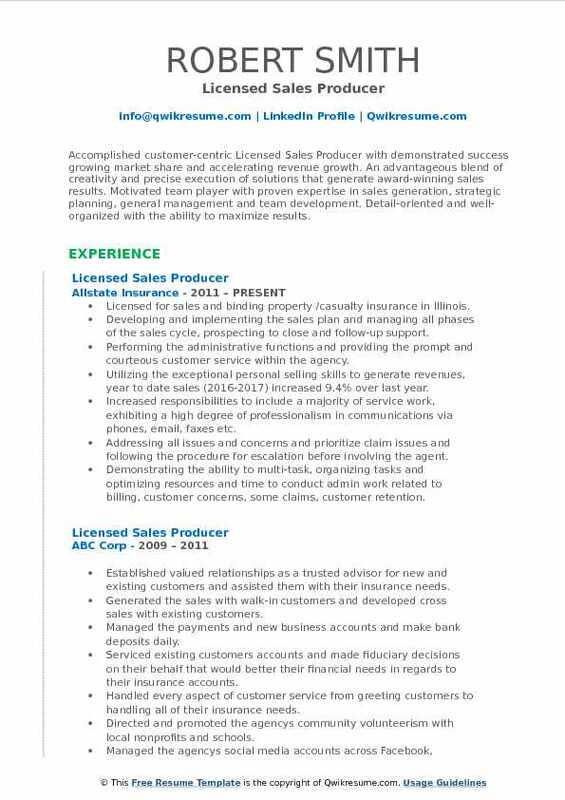 Licensed for sales and binding property /casualty insurance in Illinois. Developing and implementing the sales plan and managing all phases of the sales cycle, prospecting to close and follow-up support. Performing the administrative functions and providing the prompt and courteous customer service within the agency. Utilizing the exceptional personal selling skills to generate revenues, year to date sales (2016-2017): increased 9.4% over last year. Increased responsibilities to include a majority of service work, exhibiting a high degree of professionalism in communications via phones, email, faxes etc. Addressing all issues and concerns and prioritize claim issues and following the procedure for escalation before involving the agent. Demonstrating the ability to multi-task, organizing tasks and optimizing resources and time to conduct admin work related to billing, customer concerns, some claims, customer retention. Summary : Exceptionally driven Licensed Sales Producer II with 17 plus years of experience in the Finance domain with the results-charged career in transformation, growth, and profitability of companies within highly competitive industries. Senior Account Management, High Net Worth Underwriting, Healthcare Sales and Recruiting. New Business Development professional repeatedly successful in driving revenue, capturing new opportunities. Working remotely out of Naples home office for newly established Connecticut Allstate agent to produce new business. Telemarketing to qualified prospects through established leads management database to sell, quote, and close new business. Selling auto, renters, condo, personal umbrella insurance. Referring the life insurance leads to Allstate financial representative. Submitting up-to-date activity and production logs to agency management for review. Calculating the quotes and educating the potential clients on insurance options. Underwriting every new business file to ensure compliance with both company and agency standards. Objective : Licensed Sales Producer with over 2 years of experience in the hospitality industry specifically in Rooms Operations, Human Resources, and General Accounting. Well-developed strengths in critical analysis, risk assessment, employee development, strategy development, and management as well as a unique ability to serve as power of influence across organizational levels. Administered all leads and performed the sales calls for same to facilitate more accounts. Maintained knowledge of all underwriting and rating plans and ensured compliance to same. Developed all required sales documents and sign all documents as per requirement. Ensured adherence to all policies and procedures and maintain knowledge of all new products in the organization. Coordinated with customers to manage all expiration dates for policies. Collaborated with customers to maintain efficient pools of all referrals. Designed efficient relationships with all customers and ensured the compliance with all production requirements. Administered all prospects and prepared and sent solicitation letters to same. Partnered with numerous property and casualty agencies, helping them reach specified life insurance goals. Driving sales through a cold call strategy, accompanied by follow-up on targeted marketing campaigns. 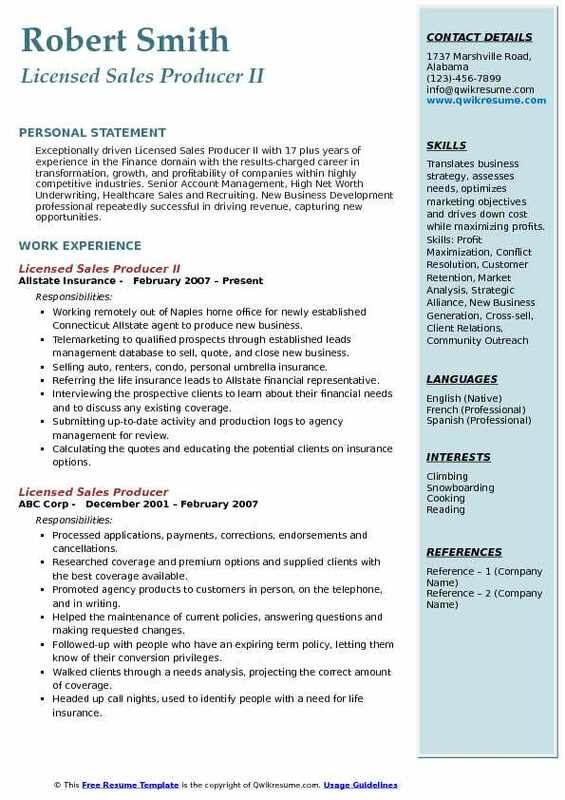 Headline : Licensed Sales Producer with 6 years of experience in the Finance domain seeking employment in a career geared toward social work. I am an employee who goes above and beyond basic administrative tasks and takes on multiple projects at once. Excellent work ethic and strength in boosting company morale. Skills : Customer Service, Coaching, Insurance, Conflict New Business Generation, Cross-selling, Up-selling, Resolution, Customer Retention, Property Casualty Client Relations, Community Outreach, Build Strategic General Insurance, Underwriting, Healthcare Industry. Alliances, Identify Key Partnerships, Establish Immediate And Effective Rapport. Top performing licensed sales producer with sales consistently exceeding monthly premium goals. Called on policyholders to deliver and explain policy, to analyze insurance program and suggest additions or changes, or to change beneficiaries. Sought out new clients and develop clientele by networking to find new customers and generate lists of prospective clients. Sold various types of insurance policies to businesses and individuals on behalf of Allstate insurance including automobile and property. Explained the features, advantages, and disadvantages of various policies to promote the sale of insurance plans. Performed administrative tasks, such as maintaining records and handling policy renewals. Attended the meetings, seminars, and programs to learn about new products and services, learn new skills, and received technical assistance in developing new accounts. Explained the features, advantages and disadvantages of various policies to promote sale of insurance plans. Customized the insurance programs to suit individual customers, often covering a variety of risks. 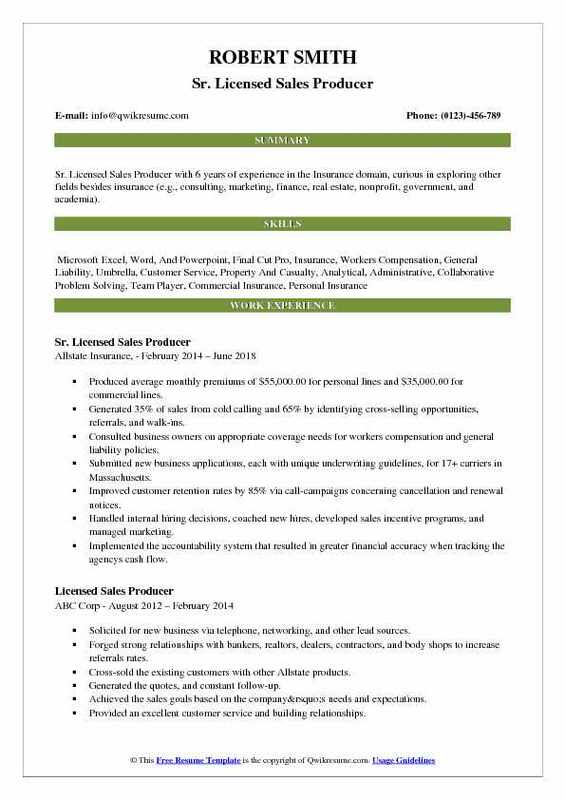 Summary : Licensed Sales Producer III with 18 years of experience in the Finance domain is seeking to obtain a position by utilizing my skills and education to provide excellent customer service, leave my clients satisfied, as well as benefit my employer. Enjoys challenge seeking opportunities to learn and improve skills. Developing the marketing campaigns to increase new business and cross-sell current clients. Accomplished 10 years of customer service, billing assistance, and experience in the insurance industry. Redesigning and creating new quote forms and contact information to better assist the agent and staff members. Obtaining the prospect information and developing a cost-benefit analysis for their insurance needs. Processing the new business applications for homeowners, earthquake, auto, pup, landlord, condo, renters, motorcycle and boat owners insurance. Advising in policy reviews and processed endorsements as well as commercial certificates. Generating sales through the agency and current clients. Working closely with clients to identify their changing needs and ensure they are properly covered. Assisting the agent with state and company. Initiating an aggressive campaign of cold-calling, offering referral incentives and participating in networking events. Providing prompt, accurate, cost-effective service by responding to inquiries from existing policyholders and the general prospect/leads database regarding insurance availability, the eligibility, coverages, policy changes, transfers, claim submission, procedures, and status etc. Completing all company insurance renewals including property, auto, commercial. Answering the phones, making policy changes, reporting a claim, checking the status of claims, requesting/ordering insurance cards, taking payments, preparing insurance binders and assisting the customers with various other customer service issues. 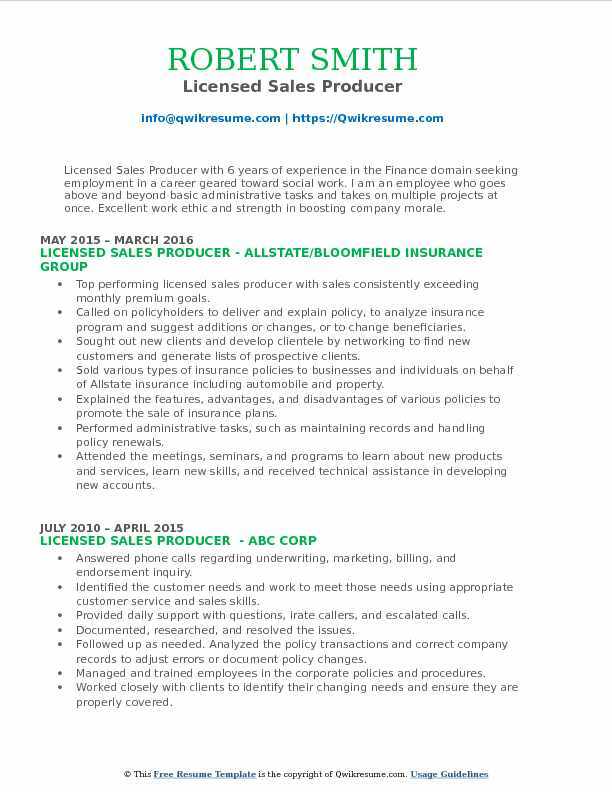 Actively quoting and selling the auto and home insurance as a fully licensed and certified sales producer with Allstate insurance company. Assisting the prospects in obtaining appropriate coverages on policies such as homeowners, automobiles, power sports vehicles, rentals and personal umbrellas; responsible for telemarketing. Assisting in servicing policies and preparing bank deposits. Summary : Licensed Sales Producer with 10 years of experience in the Finance domain is seeking to obtain a position within a company where I can best utilize my experience in finance, sales, customer service to enhance growth and increase profitability. Customer liaison for coverage updates and insurance alterations for policies. Insurance coverage specialist providing coverage information insurance quotes for new and existing customers. Answered the telephone, processed mail, filing, typing, word processing, handled multiple correspondences and updated the policies. Evaluated and recommended new process which contributed to exceed objectives within last two quarters. Specialized in sales, sales training, office management strategic management. Prospected for new business through various campaigns, including networking, target seminars, and cold calling. Inputted the clients' current rate/coverage for more competitive product and solution solving. Creatively and realistically presented the customer with a variety of product knowledge in relation to coverages involving all personal lines of insurance. Consistency in meeting or exceeding personal goals, striving to be the best, contributing as a team player while learning from others actions and accomplishments.